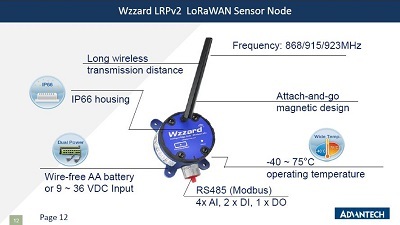 Wireless Connectivity Where You Need It - The Wzzard™ intelligent wireless sensor platform creates a complete, quick and easy connectivity stack between your sensors and application – on your network or the Internet. The platform uses Wzzard mesh sensor edge nodes and a wireless 802.15.4e SmartMesh IP network to transmit sensor data to a SmartSwarm Gateway. The gateway can connect to the Internet via wired connections or cellular data networks and communicate with application platforms using the MQTT IoT protocol and JSON data formats. Wzzard mesh wireless sensor nodes can accommodate virtually any industry-standard external sensors. Connections can be made via M12 connector or conduit fitting. The nodes provide a wide variety of sensor interface options, including general purpose analog input, digital input/output and thermocouple. All nodes contain an internal temperature sensor. Secure, Reliable and Highly Scalable Wireless Networking - The 802.15.4e Wzzard platform uses mesh networking and time-synchronized channel hopping to provide up to 99.999% connectivity, even in the most demanding RF environments. New nodes may be added at any time and the SmartMesh IP network will dynamically self-configure as new nodes are added or removed. Easy Configuration and Installation - Configuration of the Wzzard sensor platform is easy via the SmartSwarm Gateway. Nodes can be configured with scaling information, eng. units, friendly names, geo-location and other descriptive information. The platform simplifies physical installation, too. Nodes can be attached to any surface via mounting ear flanges and screws or the embedded magnetic base. Permanent use of the magnetic mount is not approved for UL installations, but may be convenient for temporary RF link determination or other purposes. The IP67 rated, fiber reinforced polyester PBT housing makes the units deployable in any industrial or commercial environment. Intelligence at the Network Edge - The Wzzard wireless platform places intelligence at the network edge. The Wzzard mesh wireless sensor nodes can be configured to communicate data only when specified threshold or alert levels are exceeded. When reporting, they can associate useful information like geo-location, device name and uptime. This eliminates unnecessary network traffic, eases the processing burden on upstream resources and cuts the cost of cellular data plans when the gateway is using the cellular data network. Thanks to low-power wireless technology and programmable time synchronization, the Wzzard mesh wireless sensor nodes can operate for many years on battery power. NOTE: UL applications -indoor only, with mounting ear installation.